Amazon didn’t introduce a 10-inch tablet Thursday, as many tech pundits had predicted, but the company did roll out a potential iPad rival in the form of its $499 Kindle Fire HD. The 8.9-inch tablet offers 32GB of storage and runs on the 4G LTE network. It’s now available for pre-order and ships Nov. 20. That wasn’t the only tablet to get some time in the spotlight Thursday during an Amazon press event at a Santa Monica, Calif., airport hanger. Amazon CEO Jeff Bezos also showcased low-priced 16GB versions of the new tablet—an 8.9-inch tablet for $299, which also ships Nov. 20, and a 7-incher for $199 that ships Sept. 14. The company also took the wraps off an updated version of its current Kindle Fire tablet as well as a new e-reader called the Kindle Paperwhite. The Kindle Fire HD features dual-band wireless connectivity, dual stereo speakers, and 25 percent less glare than the original Kindle Fire. When introducing the new tablets Thursday, Bezos emphasized the Kindle Fire HD’s Wi-Fi connectivity, which he claimed is up to 41 percent faster than Apple’s latest iPad. Bezos explained that the Kindle Fire HD leverages MIMO technology, which uses advanced antenna engineering to improve Wi-Fi speed and reception. The boosted storage capacity (from 8GB to 16GB) and fast Wi-Fi are essential to Amazon’s primary focus: content. Amazon offers its devices at low prices but makes up for those losses when customers purchase content, according to Bezos. For $50 a year, anyone who buys the $499 Kindle Fire HD will get 250MB of data per month and a $10 Amazon credit. Not mentioned during Bezos’ presentation: What happens if you go over that 250MB allotment? Amazon is supplementing its content on the Kindle Fire HD with new features like X-Ray for movies (where users can pause a film to get more information about actors from IMDB); Whispersync for games (so players never lose their place and have to start over); and Immersion Reading for audiobooks (users can both listen to and read their books simultaneously). Amazon last week announced that the original Kindle Fire is sold out, but the company is introducing an upgraded version and slashing the price from $199 to $159. The upgraded Fire will ship Sept. 14. Amazon’s new Kindle Paperwhite, a front-lit e-reader with 25 percent better contrast than previous Kindles, is available to pre-order now. The Paperwhite ships Oct. 1. A wireless model retails for $119; the 3G version for $179. The new e-reader weighs in at 7.5 ounces, like the Kindle Touch, but is one millimeter thinner than its predecessor. The new Kindle features adjustable lighting with an on-screen slider. 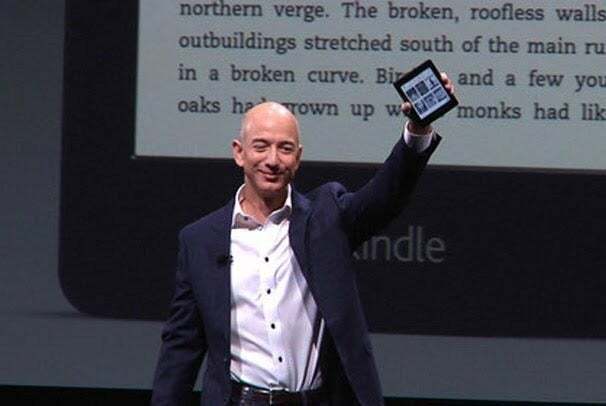 Jeff Bezos shows off the Kindle Paperwhite on Thursday. The new Kindle Paperwhite has eight weeks of battery life with the light on. Consumers can access content using Amazon’s cloud service. In contrast, the Kindle Touch was introduced last year for $99 with a 3G model available for $149. Amazon slashed the price for a slightly improved basic Kindle, which will be available Sept. 14, from $79 to $69.